The Battle of Dannoura in 1185 was the final confrontation between the forces of the Taira (Heike) and Minamoto (Genji) families. Led by the young warrior Minamoto no Yoshitsune, the naval battle ended in a decisive victory for the Minamoto clan. The opposing leader, Taira no Tomomori (1151-1185) committed suicide and his several thousand men were drowned, along with the child emperor Antoku. Later dramatizations and narratives, beginning with The Tale of the Heike (Heike monogatari) became widely familiar, and the historical story was embellished further through following centuries. 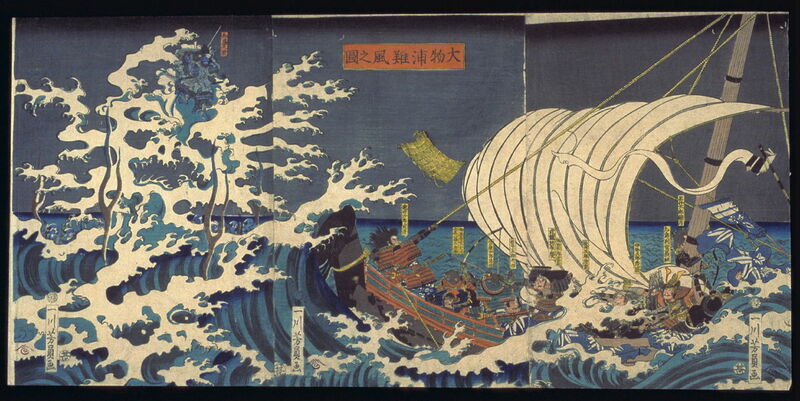 This triptych shows a popular scene of later legend, when, out for revenge, the ghosts of the the vanquished Taira forces rise up in a storm as Minamoto heroes cross the sea. If you click on this image and enlarge it you will see several of those ghostly figures hidden among the waves in the left-hand panel. Use the zoom tool to see the ghost of Tomomori (知盛) riding atop the waves on the right-hand panel. You will also see some of his ghostly army lower down. Also, there are those strange free-floating flames which mean that something otherworldly is happening. Daimotsu Bay is in the northeast part of Osaka Bay right off the area of Amagasaki. To see this location click on the Google map link above. A friend of ours observed while viewing this triptych that the sail is being driven by a wind coming from our right while the waves are being driven by winds from our left. Artistic license? !